Food TV Cooking Club: May | Mmm, Tasty! I sort of suspected that this month’s recipe was going to be a hit. 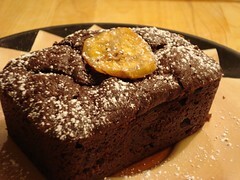 Chocolate and bananas, a fantastic combination, baked into a brownie. And yes, it was delicious, with the right balance of flavours between the chocolate and the banana. I baked mine into mini loaves because I really love my mini loaf pan. The original recipe is here, and my slight modifications are listed below. Melt the chocolate and butter together in a small bowl set over a pot of simmering water. In a separate bowl, mash together the eggs and bananas. Add the flour, sugar, cocoa and baking powder and stir to combine. Pour in the melted chocolate mixture and stir. To make mini loafs: Butter and flour your mini loaf pan (mine makes 8 loaves). Divide batter evenly between the loaves and place a banana chip on top of each loaf. Bake for 40-50 minutes, or until a toothpick comes out clean and the brownies are firm to touch.